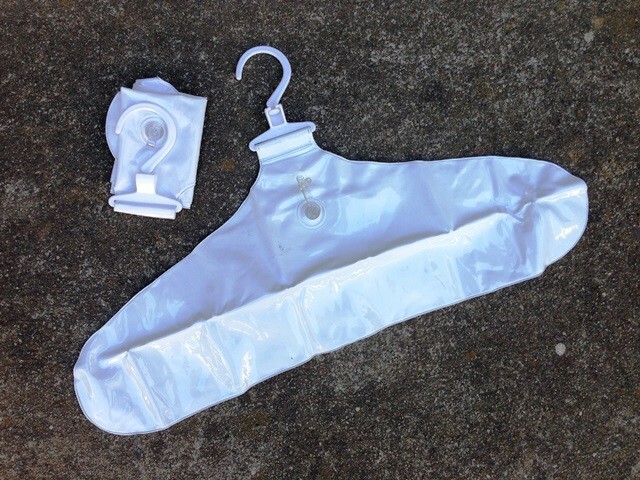 Inflatable hangers are a great way to drip-dry clothing. When inflated, the width of the hangers causes the front and back of the shirt to separate. This allows for greater circulation of air, which means that the shirts dry faster. 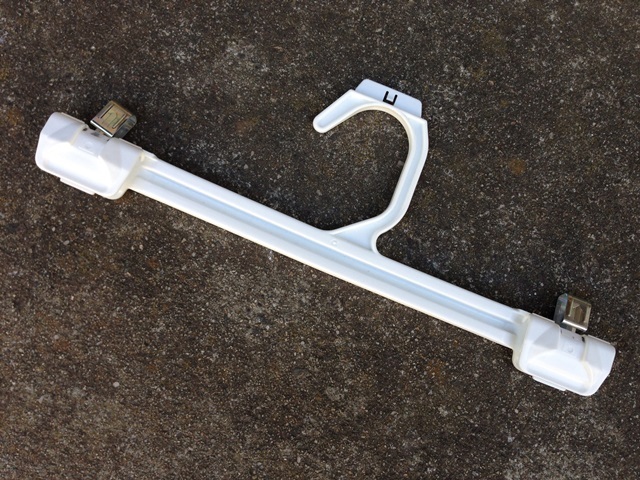 The hangers are light weight and easy to pack. I usually take two along and store them in the back pocket of my toilet kit. Most travel stores don’t carry the hangers. I bought mine off the internet. Brand is important – I bought mine from Household Essentials. I’ve had problems with both the Lewis N Clark and Travelon brands leaking. The inflatable hanger in use. Note how the shirt front and back are separated from each other, allowing for air circulation. Doug Dyment of onebag.com recommended this Flex-O-Line elastic clothes line. It is the best one I’ve used. The clothes line surgical tubing is braided, not twisted. This design detail means that clothes will stay hanging, no matter how little or hard the clothes line stretches. The small S-biner that I added to the clothes line allows me to loop both ends around a fixed object when I want to use it. The clothes line is very small and compact – I store it in my toilet kit. I bought it off the internet. The travel clothes line in use. I have looped one end of the clothes line around the shower head. I looped the other end around the grab-bar and secured it with the S-biner. The clothing items are semi-dry after the water is squeezed out of them using a towel. The excess water can freely drip into the bath tub with no worries of damage to the hotel room. Many less-expensive hotel rooms don’t carry skirt hangers, so I consider this travel item dual-purpose. 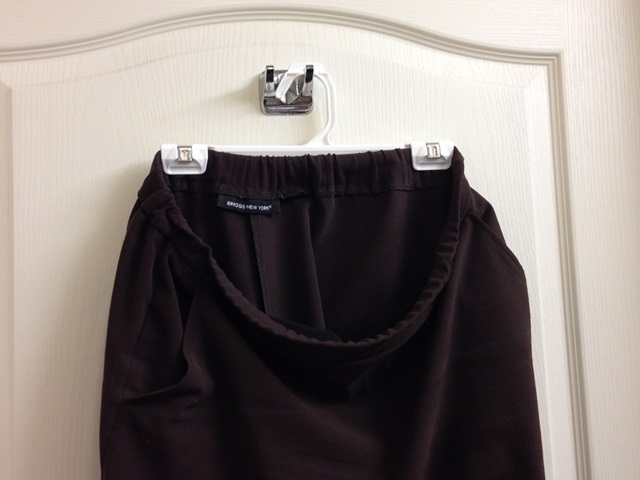 Use this lightweight plastic skirt hangar to hang up skirts and pants after laundry. 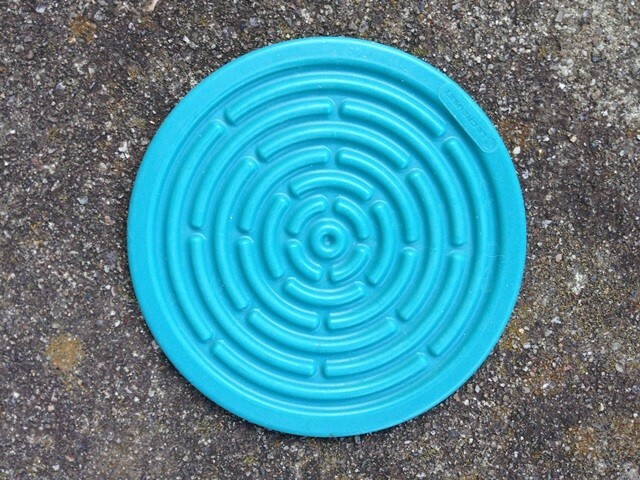 The white plastic is soft and slightly flexible. This hanger came from a big-box store. The cashier asked me if I wanted to keep it and of course I said “Yes!”. I store the hanger in the lid of my carry on bag. This is the plastic skirt hanger in use. Only clip the back part of the waist band. 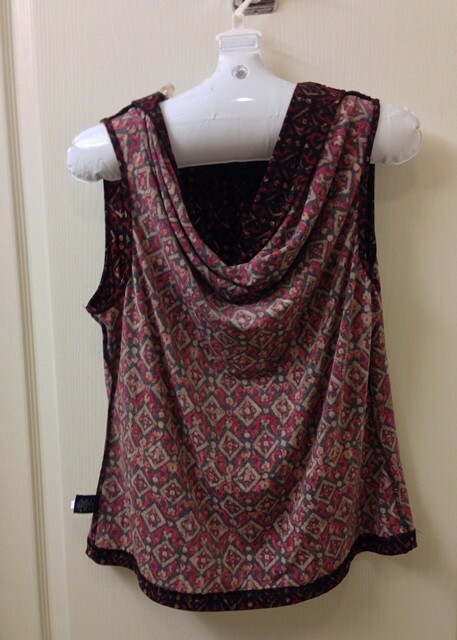 The garment hangs open for greater air circulation and faster drying time. The “Le Creuset” small hot pad is a triple use item. It works well as a sink stopper, a coaster, or a jar opener. I keep this in the back pocket of my toilet kit. 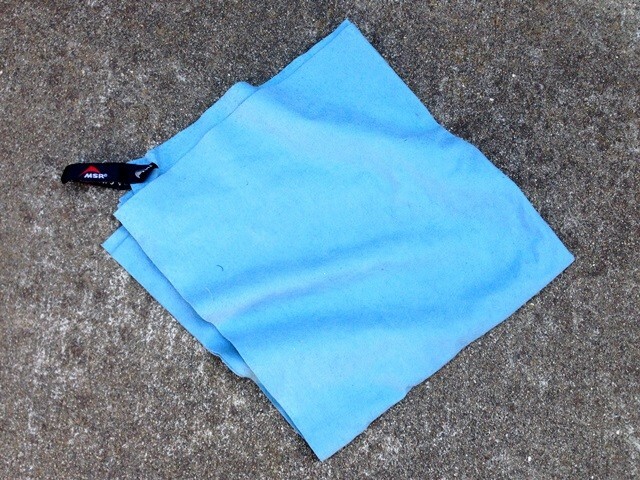 Use a light weight pack towel to absorb excess water after laundry. I carry mine when I know that I’ll be staying in a private home or in a small hotel that provides a minimum number of towels. Pack towels become softer and more absorbent with multiple washings. I store my pack towel in the lid of my carry on bag. When all else fails, an extra-large zip-top plastic bag doubles as a “sink”. Add water, soap, and a few clothing items. Zip the top and gently agitate the clothing. If you are doing laundry outside be careful about thorns and other sharp objects. I carry one of these in the lid of my carry on bag. Love the inflatable coat hanger idea…never would have thought of the advantages of the width! I carry two “universal clips” that I picked up in the laundry section of a large grocery. They have no metal parts to rust, can clip onto any hangars, and i have even used them to clip curtains together that didn’t close all the way. 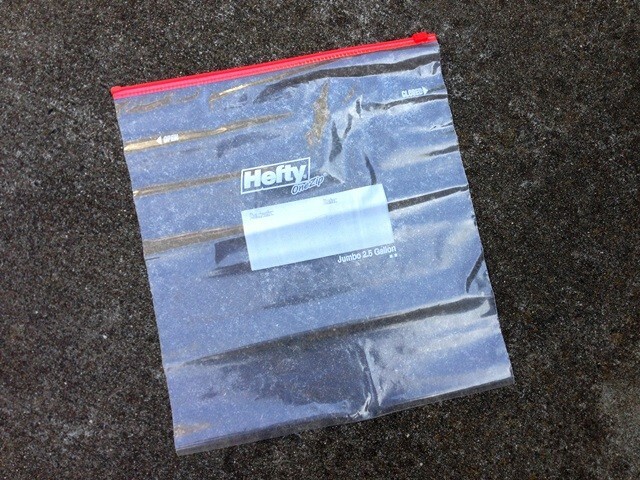 i used to carry a stiff plastic clip hangar, but it broke:( – leaving me stranded. Oooh. I like that. They’re a lot smaller – small enough to fit in the back pocket of my toilet kit along with the other laundry items. I’ll have to try it. great tips! I didn’t realise there are inflatable hangers. Will definitely keep them in mind for my travels. Great blog! 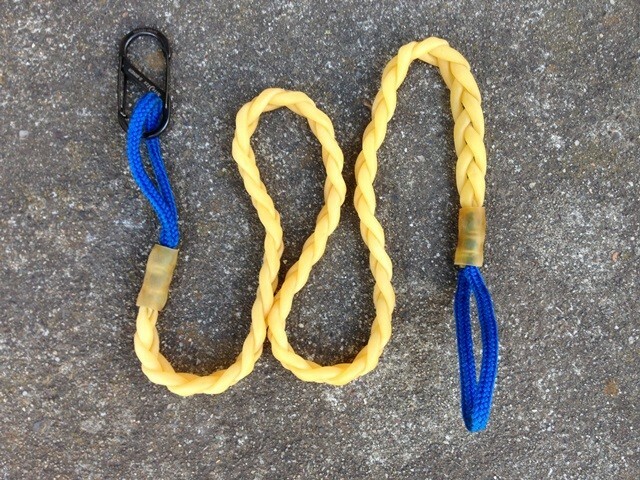 I also carry a length (maybe 6-8 feet or so) of very thin nylon rope/line. I often have to add it to my braded clothesline (like yours) in order to make it reach between two points of attachment.